PRODUCT: #LC475, 4", 4 Lb., Lead Cap Counter Flashing for 4" Vent Pipes (fits L475). Price/Each. 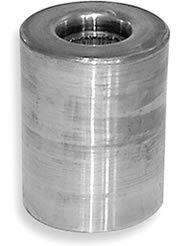 USED WITH: 4" Pipes (4.5" OD) and #L475 series Pipe Flashings. #L475, Lead Pipe Flashing, 4-3/4 in. ID x 12 in. Riser pipe, fits 4 inch pipe. 16 x 16 inch Base, 4 lb. Lead. Price/Each.